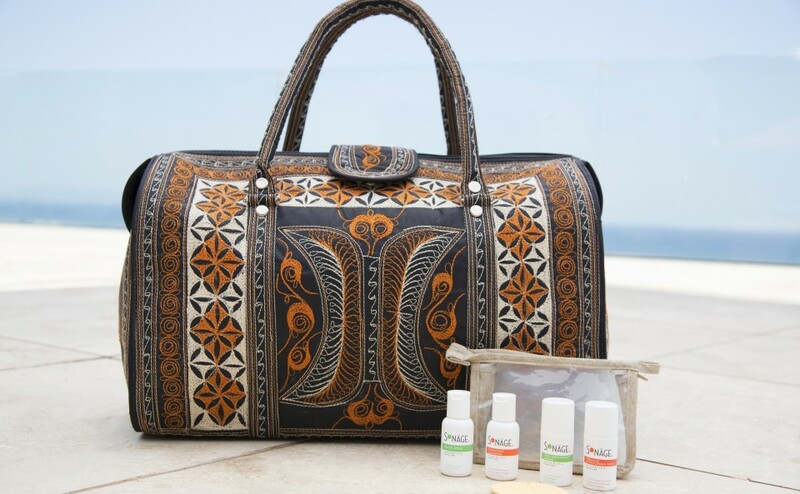 Sonäge has teamed up with Banda Bags, the collection of vegan totes handcrafted by tsunami survivors in Indonesia, to create the ultimate weekender carry-all: Banda Bag x Sonäge Skincare Weekend Travel Set. We’ve paired our Sonäge beauty bag packed with the travel-sized bestsellers and classic essentials needed to maintain a healthy complexion on the go, with a limited-edition Banda Bags weekender tote, aimed at taking the stress out of packing for your next getaway. Both brands have a 100% cruelty-free philosophy on which they’re built, so you can feel good about it too. Crushing on Banda Bags Founder and seasoned traveler Brianna Jane, we asked her to share the inspiration for the collection and her passion and tips for travel. What inspired you to create the Banda Bags line? The beautiful Indonesian people and their culture, along with my never-ending wanderlust, inspired me to create the Banda Bags line. I’d always been looking for a cool travel bag that was loud and beautiful, but it was hard to find. Then, on one of my visits to Indonesia I discovered this small group of artisans making these amazing traditional prints that reflect their culture in Banda Aceh. I decided to approach them about collaborating to make a travel bag line with their designs and Banda Bags was born. Banda Aceh is an area of Indonesia that is very isolated from the world and was absolutely devastated by the tsunami, so there is virtually no tourism. But the people are very proud of their city and I love that I can share their culture with the world in a stylish and modern way. I used to live in Australia and Indonesia is their neighboring country. I had to leave Australia on a short notice to get a new visa and decided to go to Indonesia. I didn’t know anything about it, but once I got there I instantly fell in love! It is a not only a beautiful country made up of a chain of 16,000 islands, but the Indonesian people in general are so kind and relaxed, always with a “no worries” attitude. We have so much to learn from them on how to live! I love traveling. It is what I live for. But bear in mind that traveling is not the same as tourism. Traveling means ditching the tours and 5-star hotels and truly spending time with the people whom you are visiting. Doing as they do. Consequently, traveling has inspired me, has taught me some of life’s greatest lessons and has given me the best education I could ask for. I love meeting new people, learning about their culture, language, their traditions and behaviors, (even though sometimes unsanitary!) I have learned so much about the world and about myself. How has traveling made you a more creative person? Traveling takes me to the unfamiliar, gets me out of my comfort zone, brings me into contact with people who think completely different from me. Not to mention seeing beautiful scenery that leaves you breathless…these all make my head spin and when that happens I get inspired! Traveling also gets me writing in my journal, which I find I don’t do enough when I am back home. A sarong – use it as a cover-up, a beach blanket, a sheet when you don’t have any… so many uses for the sarong! A book – there are always going to be delays or long trips when you are traveling, a good book will keep you occupied and stimulate your brain! And I love how many places I go to you can swap books and leave a message for the next traveler who picks it up. Probiotics – this is a supplement that will protect your stomach and boost your immune system. Eating weird street foods and flying in an airplane can both make you sick. Probiotics will save your life! Brita portable water bottle – this is great for reducing your consumption of plastic water bottles and also allows you to take water from the airport without having to pay a fortune for a bottle of water! Baby wipes – if you don’t have access to a shower this is second best! Removes your makeup and is good for cleaning the odd-spill or dirt that gets on you. What’s on the top of your travel destination bucket list? I am dying to go to Bhutan!!! This little Buddhist kingdom not only looks absolutely stunning, but it fiercely guards its ancient traditions. Only a limited number of people are allowed to visit every year and you have to pay a lot for a visa, hence tourism is relatively low, but this helps maintain the integrity of their culture. They also are the only country in the world whose GDP (gross domestic product) is actually referred to “Gross National Happiness” (GNH), and they really emphasize the importance of keeping a balance between the spiritual and the material lifestyle. I think that concept is just gorgeous. Brianna Jane is the founder of Banda Bags, a one-of-a-kind, head-turning collection of vegan totes handcrafted by tsunami survivors in Indonesia for the ethically conscious consumer. An entrepreneur and international business woman with experience across the globe, having lived and worked in Miami, Sydney, Montreal and currently in Los Angeles, she is also the writer, producer and host of a travel television show.